The M-497 (nicknamed Black Beetle by the press) was an experimental jet-powered railcar test bed of the New York Central Railroad, developed and tested in 1966 in the United States. 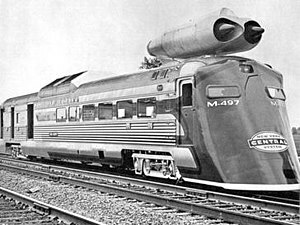 Two second-hand General Electric J47-19 jet engines, originally used as boosters for the Convair B-36 Peacemaker intercontinental bomber, were mounted atop an existing Budd Rail Diesel Car, an RDC-3 of coach and baggage-mail configuration which had received a streamlined front cowling. The construct was then successfully sent on test runs over the existing tracks between Butler, Indiana, and Stryker, Ohio. The line had been chosen for its arrow-straight layout and good condition, but otherwise unmodified track. On July 23, 1966, the car reached a speed of 183.68 mph (295.60 km/h), an American rail speed record that still stands today. Even with this spectacular performance, and even though it had been built relatively cheaply, using existing parts, the project was not considered viable commercially. The railroad gathered valuable test data regarding the stresses of high-speed rail travel on conventional equipment and tracks then existing in America. The data was largely ignored, as the NYC was headed for merger with its arch rival Pennsylvania Railroad. The Pennsy was already heavily involved in the Metroliner project, funded by the United States Department of Transportation. M-497 continued to serve for Penn Central after the jet engines were removed until retirement by Conrail in 1977. Engines were re-used as X29493, an experimental snow blower. Like most similar jet engine blowers, it was effective at clearing snow and ice but also tended to dislodge the ballast. ^ Morris & Wetzel, pp. 10,20. ^ a b "It's a Jet! It's a Train! It's M-497". Dark Roasted Blend: Weird and Wonderful Things. 2007-01-12. Retrieved 2008-03-21. ^ a b Wojdyla, Ben (2008-02-21). "Retro: New York Central's M-497 Jet Powered Train". Jalopnik.com. Retrieved 2008-03-21. ^ Truscott, Tim (2010). "Some Earlier High Speed Rail Accomplishments". The ESPA Express. The Empire State Passengers Association. 34 (4): 8. ^ Morris, Hank; Wetzel, Don. "The flight of the M-497" (PDF). pp. 15, 17. Archived from the original (PDF) on 2013-02-28. This page was last edited on 21 November 2018, at 01:59 (UTC).